What can you say about a place that has 181 (!) 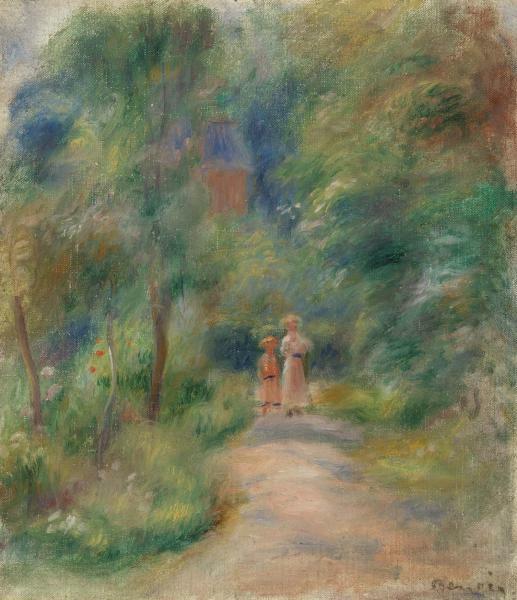 Renoirs, 69 Cezannes, 59 Matisses, and 46 Picassos among its holdings, all of them unlabeled (!) and hung in an idiosyncratic manner reflecting a personal and unique philosophy about art? Volumes! And art critics have. The relocation of the collection of the Barnes Foundation from his original home in Merion, Pa. to a millimeter-accurate reconstruction of its interior within a larger, $100 MM modern structure on Philadelphia’s “museum quarter-mile” was controversial in the extreme. Like every other Philadelphian, I have an opinion, but that’s not the the subject of this post. My most memorable visit was in the month of my 40th birthday, almost a quarter-century ago, when a woman (an artist herself) with whom I fell in love deeply and madly made me look at Bonnards differently… but that’s another story for (and of) another time and life. My most recent visit – yesterday – also served as the beginning of a personal project: to “capture” my personal favorites. It’s the body language and expression on the woman’s face that distinguishes it for me. She’s absorbed by something yet self-contained and at ease. She doesn’t appear to be waiting for someone, yet has ceded most of the couch, placing herself at one end. And in that positioning and in that empty space beside her is her story. And that makes it a painting I can look at again and again. 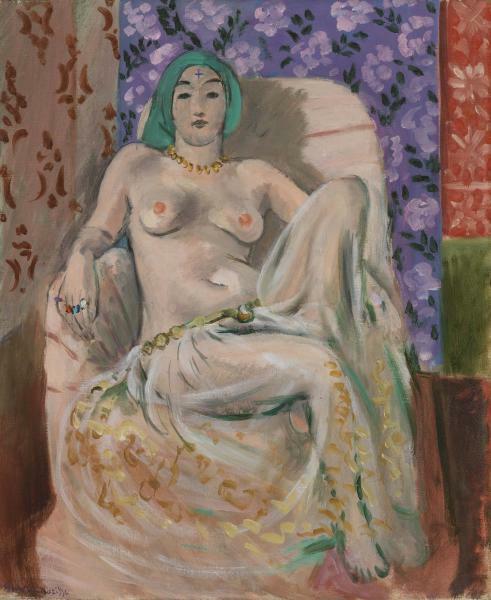 Of Matisse’s many paintings of odalisques, this one is absolutely my favorite because the subject, a subjugated woman stares at the artist with a pose and look that is the opposite of her state. Her expression is a cypher, her body’s nakedness and brazen angles a study in secure acceptance of the self: she owns herself regardless of her legal status. She hides nothing, is ashamed of nothing: her dignity is intact. And Matisse captures that. Aside from the relative size of the figures and their gender, we know nothing else about them: their ages, their conversation, their lives. And so, this mother and daughter – my conjecture (and probably the most universal one) – stand-in for all the mothers and daughters who have taken a woodsy walk together on a fine Spring or Summer day and bonded over everything from a shared silence to spoken secrets. And that warms my heart. How charming his expression, how swaddled she is in heavy linen, how delicious the bouillabaisse in the tureen must have been, how proper the whole scene…. 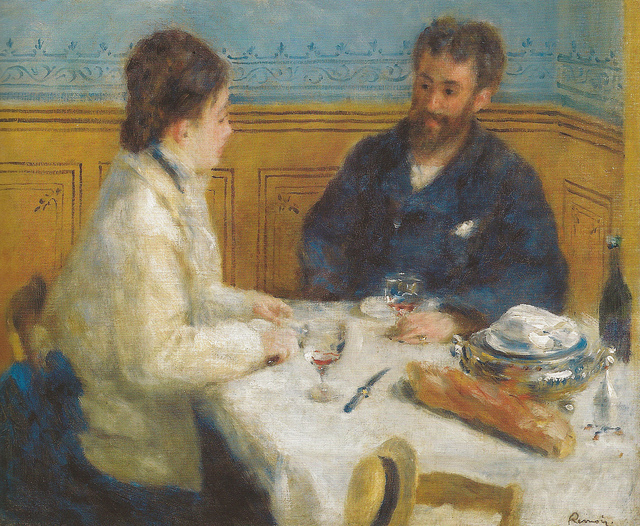 This is the lunch at the beginning – the rosy, innocent beginning – that bookends with Degas’ Le Interieur at the other, unpredictable end. The link will take you to the Degas and its story… or one version of it. Once you’ve read that, you’ll understand. 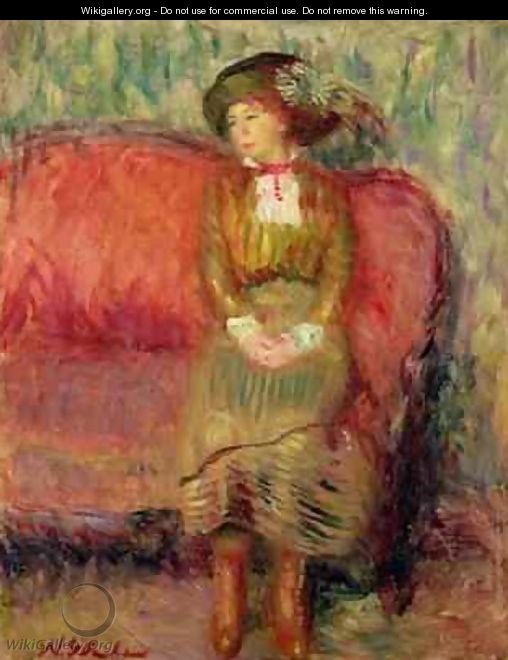 This entry was posted in Uncategorized and tagged Degas, Luncheon (Le Dejeneur), Matisse, Moorish Woman (The Raised Knee), Renoir, The Barnes Foundation, Two Figures On a Path, Woman Seated On a Red Sofa. Bookmark the permalink. Maybe because I first saw the Barnes collection when it left Philly for the 1st and only time to the National Galllery of Art, I think the art transcends the setting but I agree the collection, right down to the hinges, is amazing. Exact replica it may be, I felt the new Barnes was cold, but I could still sit and stare at my favorites, the Seurats, the Cezanne landscapes for hours.